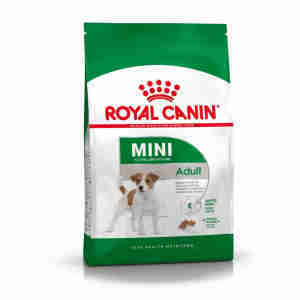 Royal Canin Mini Adult is made from ingredients that are especially good for small dogs. It can help prevent the dental, digestive, and weight problems common to smaller breeds. Small dogs are certainly adorable, but they also face their own set of unique health risks. If your dog is between one and 10 kilograms in weight, Royal Canin Mini Adult can be a great choice for them. It can help your dog avoid dental problems by keeping their teeth and gums clean. Smaller dogs, especially toy breeds, tend to be more at risk from obesity too. This is because small dogs can often have a lower metabolism with a large appetite. That means that despite their size, they might want to eat as much as a large dog! A diet that is especially designed for your small dog can help to avoid most of these problems. a mix of vitamins and amino acids make your dog’s coat shiny, healthy, and glorious. great taste means even the fussiest of eaters will enjoy this food. The food is specially created to help your small dog enjoy a healthy happy life. It contains L-carnitine, a special ingredient that helps to keep your dog’s appetite in check, so they won’t overeat. A mix of nutrients also reduces tartar build up in your dog’s mouth. If left unchecked, this can cause a number of health problems such as tooth infections, or stomach trouble. Plenty of vitamins are included too, and these can keep your dog’s coat looking shiny and healthy. Because some small dogs can be very fussy when they eat, this food is carefully blended to taste great. Your dog is sure to love every meal! If you have a younger small dog, then Royal Canin Mini Junior is a great food to start them out on, too. COMPOSITION: dehydrated poultry protein, maize, maize flour, animal fats, maize gluten, vegetable protein isolate*, wheat, hydrolysed animal proteins, rice, beet pulp, minerals, fish oil, yeasts, soya oil, fructo-oligo-saccharides. ADDITIVES: (per kg): Nutritional additives: Vitamin A: 22500 IU, Vitamin D3: 1000 IU, E1 (Iron): 42 mg, E2 (Iodine): 4.2 mg, E4 (Copper): 13 mg, E5 (Manganese): 55 mg, E6 (Zinc): 164 mg, E8 (Selenium): 0.11 mg, L-carnitine: 50 mg - Preservatives - Antioxidants. I buy the royal canin food plus miscellaneous items and the prices, range of products on offer, ease of purchase and speed of delivery are all excellent. A very good product which my dog waits for with great anticipation. Ordered My dog food from Pet Supermarket and the service was excellent as was the price. Great place to shop for all your pets needs.